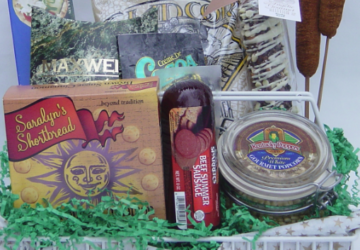 Looking for a gift basket class you can take in the comfort of your home? You’ll find lots of classes here for you, all with discussion forums to talk directly with Shirley. Here are your class topics. Each link takes you to full descriptions and enrollment information. Here’s a comprehensive course with 12 lessons delivered online to you twice weekly in 6 weeks. 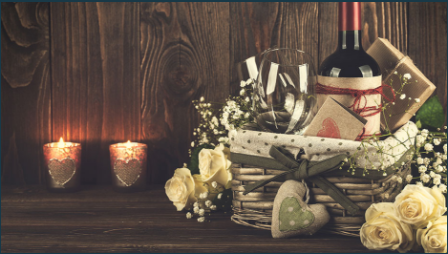 Shirley answers all of your questions on the active discussion forum and also provides you with ideas and insights to make your gift basket success dreams come true. 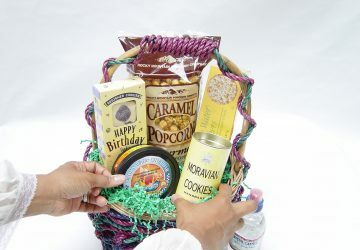 This class is extremely popular and is the longest-running and successful gift basket course online. Check out the entire course, and join us today. Start your creative hobby or business today! 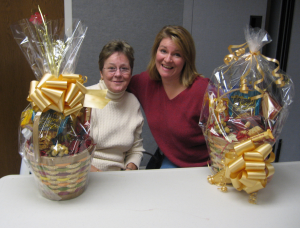 This three-hour mini course includes videos showing gift basket and bow making demonstrations. You’ll love the course’s quick pace and your ability to keep up with the ideas Shirley shares with you. Ask questions on the discussion forum so Shirley guides you to make smart decisions about your creativity. Here’s where to see all of the class information and join now. This course wastes no time getting you started making and selling gift baskets. You get lots of help in this class through videos, an audio, pricing help, and a handy how-to-start checklist, too. As always, Shirley’s here to guide you on the discussion forum where you can ask every question that comes to mind to start, grow, and profit the right way. See the complete class description, then join us! 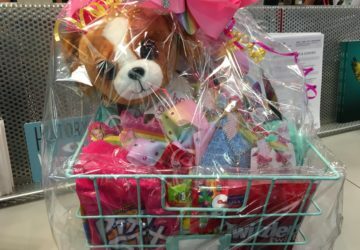 Making gift baskets is fun and easy. 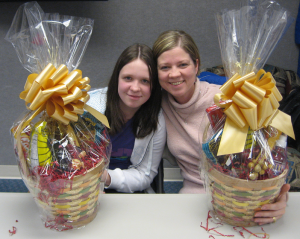 Marketing gift baskets is totally different and a bit more difficult. After all, you don’t know where to market, how to market, or how to approach people in person or online. It’s a problem, and this Gift Basket Marketing course is the solution. Stop the confusion and start selling your beautiful designs with this course! You’ll see lots of visual demonstrations so you’re ready to make and sell the masterpieces you create. Beginners welcomed! Traveling, walking, or shopping? Download audio content available in the course and take it on the road so you’re always learning. Discover your best buyers, how to reach them and sell to individuals and corporations for every day and special occasion orders. 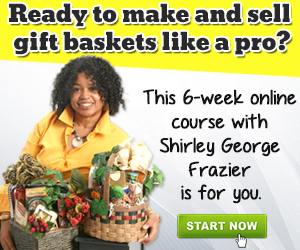 You’re in good company with Shirley George Frazier – author, speaker, and the world’s expert on gift baskets as your mentor. You’ll have questions about what you learn here, and Shirley will respond to you in the forum. Checklists, downloads, and other resources accompany each course so you’re ready for success. Read these testimonials – unsolicited comments from students like you! I’ve followed every lesson thus far with mounting interest and excitement! I hadn’t expected to find such a course on line, but I’m soooo glad I did. Having ventured into the gifts industry a little while back, I find this course very useful for creativity, administration & business. Thanks Shirley, your lessons are precise and inspiring. I provide instructions during the second lesson on how you can show me your gift basket so I can give you feedback on the structure, colors, bow, and total design. There is no limit whatsoever! Past students have asked dozens of questions during each lesson, and so can you. I respond to each question quickly and thoughtfully. Thankfully, gift baskets are a universal gift, and I’ll be able to guide you no matter where you live. Many of this class’s students come from all over the world. I’ll help you to find your success! The price is set by the school in which you enroll through online. Click on the name of each class to read its description and see the price. Clicking the button won’t immediately sign you up for the class; you’re clicking to see the price. From there you can decide when to enroll. The best way to check on this is to contact the school that administers the course since each facility has different rules. That’s the local school where you enroll. You’ll see their name as you sign up. Because each class is delivered online so you receive each lesson at your convenience by computer, we unfortunately never see each other in person. However, this online classes make it possible for you to quickly get started with gift baskets, and that’s much better than waiting for me to travel to your area which may never happen. The answer is “Yes, absolutely!” You will have a firm grasp of all the administrative and design details necessary to start your business. Best of all, you can ask me as many questions as you wish to ensure that all the information you need is answered. When the course ends, hopefully you will have asked all of your questions, as you have lots of time during the class and weeks after it ends to get all the information you need. In this class I tell you everything with no holds barred. There are no secrets, no diversions, nothing that you can’t ask or won’t learn. I encourage you to enroll through the link below and experience this for yourself! 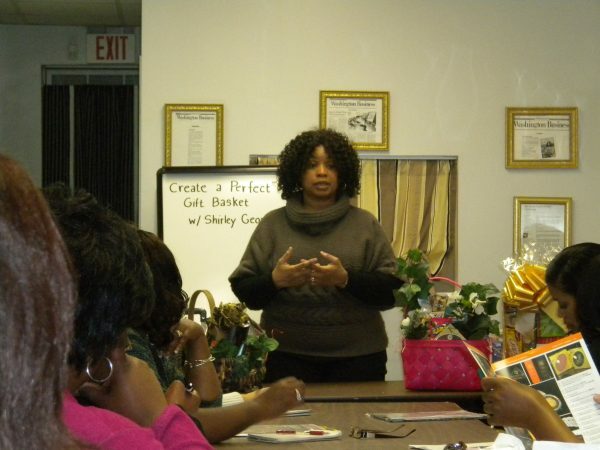 This course covers every possible gift basket topic. 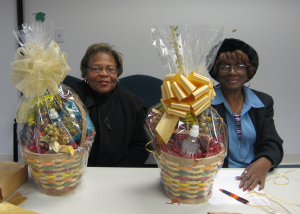 However, if there’s a question or situation that’s specific to gift baskets that, for whatever reason, is not covered in the course, you are encouraged to ask. I’m your mentor and am ready to answer. Absolutely! In the Start Your Own Gift Basket Business class, there’s a lesson with all of the pricing formulas that the example designer uses to determine how much profit she’ll make with each order. From the descriptions and examples, you’ll be able to choose the formula that’s right for you. In the other courses, you can ask about pricing directly in the forum. Many students in the classes share names of wholesalers with other students. That’s one way to get this information. I try my best to share this as well; however, because you live in an area that’s probably different than me, I help you to uncover wholesalers located close to you that sell quality products. 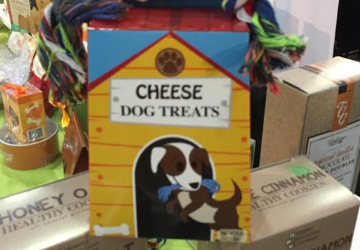 That will help you see their products in person and decrease your costs, a very-important strategy when making gift baskets! A video message from me to you – then choose a class, and let’s begin together! Choose the course for you, and sign up today!